I don't usually do New Years resolutions, but maybe I should start. Every year I aim to be happier than I was the last, which isn't an easy feat. Happiness is a fleeting feeling. I find that it's hard to attain for many people which is why there are so many books written about the subject. I've read a couple and I think it usually boils down to mindfulness. Being mindful of each moment and appreciating it. But saying it and doing it are two very very different things. I feel like other moms are probably better at this than I am, which adds to my anxiety. Why can't I appreciate the moment? Why can't I just enjoy my kids? I know that adding this blog on my list of things to do doesn't help. So why do it? I don't really have that answer. My guess is that It's a bit of a release for me to bake every weekend. It gives me a sense of accomplishment. So why not write about it? I think it also may be a control issue. Life isn't controllable, but recipes and baking is. I control the ingredients, the temperature and the creative output of the photoshoots. It's about me. Sounds selfish, but in a life that revolves around working for my network and being a mom revolving around my kids, this gives me a different purpose. Plus I can eat the final product! So in the end, I guess it is all about me. Sorry kids. Sorry for not letting you help mix the ingredients, for not letting you eat the props or touch the cookies and for turning half our dining room into a studio because it has the one window that works as a light source. Because mommy has to take pictures first. So for 2018 I'm resolving to be more mindful. Sort of. I want to say that things are going to be different, or that I'm going to be different. But change is gradual and it'll probably take more than another year to get there. But big changes are coming our way this year, so hopefully, it will help me with my goals. I resolve to try or at least to be more conscious of trying. Because I love this little life we have no matter how many hours a day I spend screaming. Ok. New Year thoughts/ramblings are done. Onto what you're really here for. The bakes. 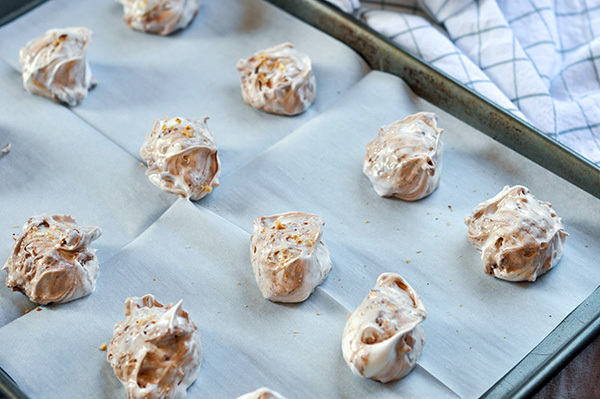 Meringue cookies have always been a favorite of mine. 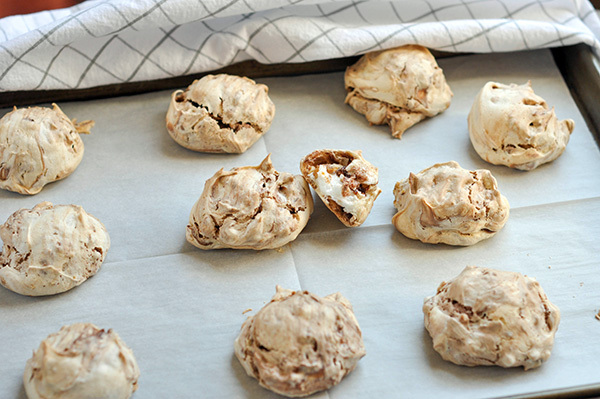 Sweet, light and airy, these cookies are gluten free and only require a few ingredients. 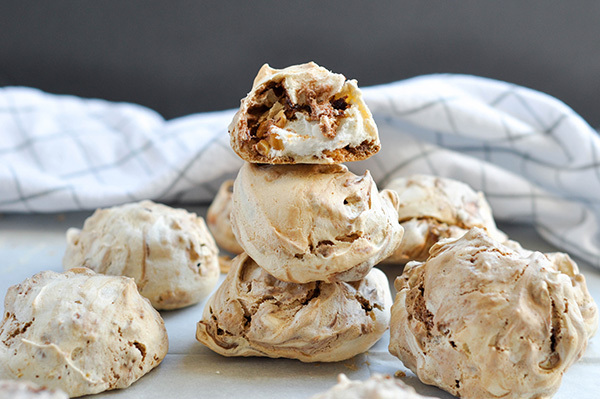 These meringue cookies are crisp on the outside and chewy on the inside. They're swirled with Nutella and chopped hazelnuts, which adds a much needed crunch element. All I can say is yum! Pre heat your oven to 300F. Line 2 sheet trays with parchment. 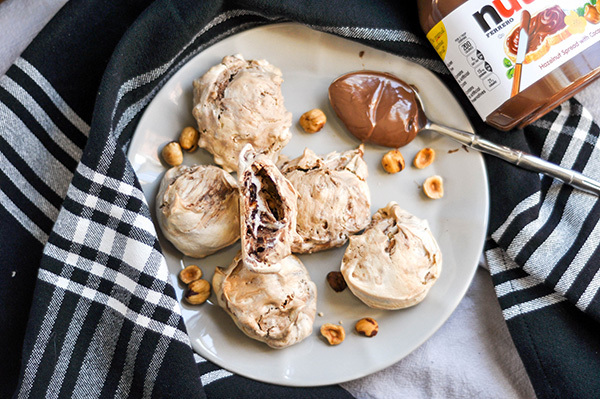 Place Nutella in a heat safe bowl and microwave for 30-45 seconds in 15 second intervals. You want to melt the Nutella so that it is liquified. In a stand mixer fitted with a whip attachment, Whip egg whites till frothy. Slowly add in the sugar in a gradual stream. Whip until you get stiff peaks. Sift in the corn starch and salt, whip to combine. 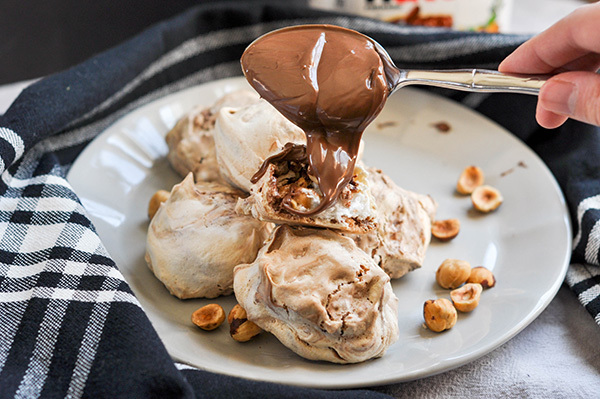 Using a cookie scoop or a large spoon, drop dollops of the meringue onto the prepared sheet trays about 2 inches apart. Bake for 20-25 minutes, then turn off the heat and allow to sit in oven for 1 hour.